The heavy metal band starring Ozzy Osbourne has announced dates for its The End tour, which kicks off on January 20 2016, in Omaha, Nebraska. 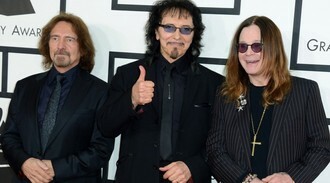 Ozzy, 66, guitarist Tony Iommi, 67, and bassist Geezer Butler, 66, who have a combined age of 199, will visit 17 North American cities before heading to Australia and New Zealand for seven shows. More concerts will be announced next month. Original drummer Bill Ward, 67, who had a falling out with Ozzy, is not part of the tour. The Grammy-winning group released its self-titled debut album in 1970. They are pioneers of heavy metal music.